For the first nine years of my life I was cared for by amahs. Nina and Rosie would tell me about their home in the Philippines. Their words and stories painted a picture in my mind of a beautiful, ramshackle place of extended families and closely-knit communities where everyone was related. It was colourful, full of life and sound, and children. Everyone was family. The Philippines may not be as I imagined, but this misses the point. What matters was that this was a picture of the Philippines guided by Nina and Rosie’s feelings. It was a reflection of their relationship with the home they had left behind. Much of what I imagined was also shaped by my own deep sense of need and attachment towards family. For much of my younger years I only saw my family every other weekend. Seeing and being with family was what I lived for, and it was the love that I felt during these moments that sustained me. We would gather at the home of my grandmother, my “pau pau”, where she would preside over her children and grandchildren. We were a large family in a small apartment. It was always crowded and full of noise, yet I never felt so comfortable. Dinner would inevitably take the whole day to prepare. Every evening an argument developed, often leading to shouting and in some cases tears – and yet, my quiet and withdrawn younger self would be unperturbed; something in me knew that such spite arose from the far deeper well of love that bound us all. This was not filial piety, but something far more noble and real: familial love. I loved Nina and Rosie too, as I know they cared deeply for me. But this love, directed and between individuals, was different to the feeling of love that I felt for family. I loved my father as well. But he had left his family when he came to Hong Kong, and the bonds had diminished. As such, my love for the paternal side of my family, I’m sad to say, always felt comparatively shallow and incomplete. As a child I may not have been capable of analysing or understanding the relationships that underpin migration, and why a person would leave their family for a new life abroad. But I was acutely sensitive to the human effects of such distance. I was sensitive to the love Nina and Rosie had for their own families and for their own home. In the Philippines they had been school teachers and nurses. They had a home, roots within a community, and the love of family. Here, in a foreign land, in the midst of a society that looked down on their race, culture and the colour of their skin, they were “mere” amahs and maids. They lived unloved and alone beyond the kitchen, by the laundry room, beside the washing machine in the smallest, saddest room in the house. 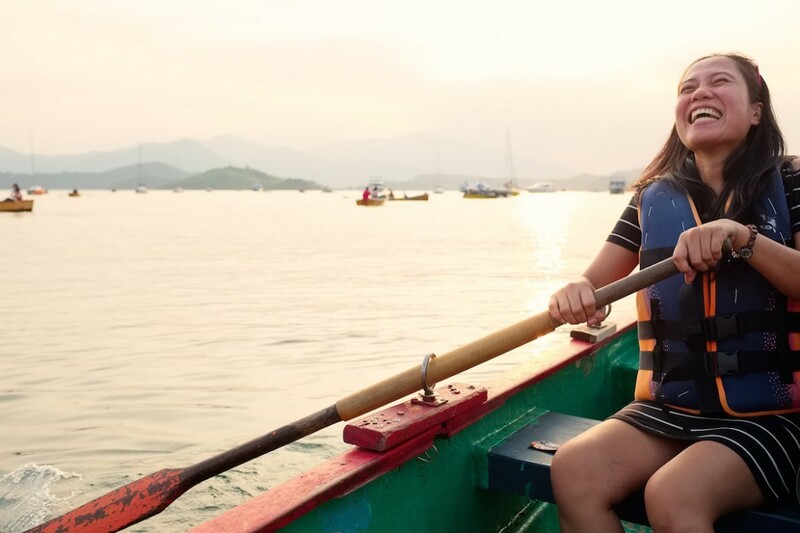 Nina and Rosie chose to come to Hong Kong to work as domestic helpers. Like my father, they accepted a mercenary position, following the money away from home. But unlike my father, they came very much as second-class citizens; to live, work and be treated as second-class people. As I grew older I began to learn about the country that was the Philippines. I learned about Ferdinand Marcos and his family, and the network of elites that ran the country. I was appalled by these families, and the system and values by which they allowed greed to blind them. New terms entered my expanding vocabulary, among them “developing world”, “basket case” and “banana republic”. The Philippines became a place I learned to look down upon. It was not because I thought Hong Kong was richer, more developed or had a stronger economy, but because it was, in my young eyes, a place that offered no future for its people. This is why it was a basket case. Herein lay its shame. Hong Kong too had its fair share of poverty and social injustice. From a young age I was told about the work of Elsie Tu, a lady I came to respect and, in more recent times, have come to know. But it was through my own family, in particular through one of my aunts, that the shameful conditions that existed here were felt. Before marrying my uncle and immigrating to the United States, my aunt had come from a squatter family. She would tell me, her curious young nephew, of how hard life could be in colonial Hong Kong. I think it was because she saw me as being part-British that she felt I needed to know. She did not hate the British, but the unequal society they had allowed to develop. And yet for all that she told me, colonial Hong Kong was not the Philippines. Neither was Hong Kong the Chinese mainland. We were a city that people fled to, not escaped from. The system may have been imperfect and the administration illegitimate in the eyes of the governed, but it had not been corrupted by an ideology nor was it beholden to the whim of a dictator, as was sadly the case in much of Asia. Our nurses and teachers were not leaving to go into domestic servitude. Most of all, Hong Kong represented for its people a hope for a better future. We were still, in her eyes as well as mine, better. Two years ago a friend of mine left Hong Kong. She was a school teacher. She had met a man online many years older than her who was prepared to marry her and sponsor her green card. The life for which she would be leaving would be hard. She would have to do manual work in cold and difficult conditions, for an income a fraction of what she had and could hope to earn here. But still she went. And today, I am glad to say, she is happy. But her happiness is not that born of what she found, but from release from that which is left behind. When I asked her recently why she left her home, her roots and her family, she replied she did so for the sake of her future and that of her future family. To remain was to watch the soil that had once sustained her roots in this city be slowly eroded, and to see those roots, that have made Hong Kong her home, wither and die. Her story is also, within my small circle of acquaintances, not unique. Her sense of hopelessness is almost universal. That Hong Kong no longer inspires hope in her people is indicative of the change that that this city has seen. My home is better than this. Nina went on to marry an RAF serviceman stationed in Hong Kong, and migrate to the United Kingdom. She returns to the Philippines each year, now with her daughter and granddaughter, where they have a second home. Rosie returned to the Philippines when her contract ended.